Yeah, I went Saturday—after I went to Khem Fest, the independent, Afrocentric comicbook convention across the street. Some newsman I am, right? I choose my fellow geeks over the front row of a Presidential campaign announcement by someone who’s been running for president for more than two months. 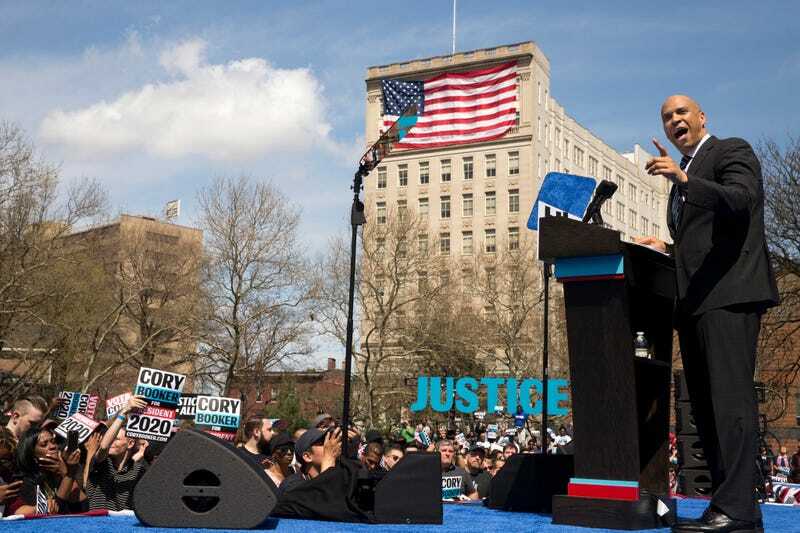 It would have been different I had been assured that Rosario Dawson was there; the only thing I like about Cory Booker is his choice of woman. I loved the fact that Booker announced in Military Park, directly across the street from Whole Foods. He’s very clear on the needs of his MSNBC-devoted audience. Around me where seniors whom I suspect had been bussed in (it was nice out, after all, and it was something to do), people who had brought their kids and grandkids (In Newark, happenings are either “positive” or not, so this was something “positive” for the tykes to participate in), and the candidate’s rainbow of blue-shirted “Cory 2020" believers. Meanwhile, while the activist-plant who unfurled the Palestinian flag and his cohort, who carried a stop-Israeli-apartheid sign, were being led out of the stands/camera range, Newarkers indifferently went on, around him, around Military Park, all around the downtown. It wasn’t exactly Chicago’s Grant Park and Barack Obama out there. Back across the street when it was over, I saw some cosplayers on the way to Khem. One dude was dressed as a TV. No more appropriate theme existed for today’s announcement. Few are inspired by Booker. And those people were there, joining the young white volunteers wanting to see their kind of history made again, needing to bleach out the underwear stain currently on Pennsylvania Avenue. What the volunteers don’t know—and what the indifferent Newarkers did/do—is that Booker is not qualified to take anyone to the Promised Land. The ol’ heat vs. light: the sun shines on him, as it did Saturday, but he tries too hard and produces too little. How can he produce “Justice For All” when his biggest fight was with Sharpe James? Yawn. He got words, but no scars. Of course few trust him. It’s clear he will make a good vice-president if he survives the primaries. His energy is infectious to those who have low resistance.